It’s par-tee time in New Orleans. That’s right—Mardi Gras! Carmella Bertrand, owner of Memory Mine, a scrapbooking shop in the Big Easy, and her bestie Ava, are front and center for one of the first parades. They can’t wait for the crazy fun that’s synonymous with Mardi Gras to begin. Carmella’s not too thrilled to see her ex-husband, Shamus, in a prominent position on the King Neptune float, but she’s determined not to let his appearance spoil her evening. The revelry turns to disaster in an instant when the float Shamus is on explodes right in front of the two women. When the smoke clears, the CEO of a local hedge fund, Hughes Wilder, is found dead. As the investigation begins, the first thing the police discover is that a lot of prominent New Orleans folks have lost a ton of money in Wilder’s hedge fund. Tops on the list is Shamus, who lost millions of dollars which he “borrowed” from the Crescent City Bank his family owns. He immediately becomes a prime suspect in the murder and turns to Carmella to help him. Carmella’s in a tricky position, because her current fiancée, Edgar Babcock, is the detective in charge of investigating the murder and has told Carmella in no uncertain terms not to get involved. Carmella resists Shamus’s plea for help as long as she can. But eventually her curiosity gets the best of her and she starts asking questions, hoping her sweetie, Detective Babcock, doesn’t find out what she’s up to. The more Carmella, with the able assistance of femme fatale Ava, noses around, the more suspects she comes up with who had a desire to murder Wilder, including Wilder’s non-grieving widow, who was having a hot and heavy affair that she made no effort to hide. 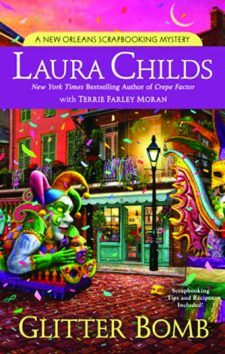 “Glitter Bomb” is another satisfying entry in Laura Child’s long-running New Orleans Scrapbooking Mystery series. An explosive and fun visit to New Orleans that doesn’t disappoint. 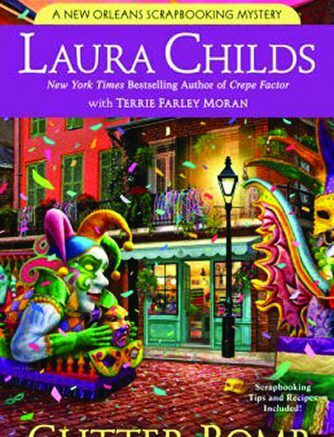 Be the first to comment on "“Glitter Bomb” by Laura Childs"